The MBOX files which are created after the conversion of EDB files can be viewed using several MBOX supporting email clients such as Netscape, Thunderbird, Mac Mail, Turnpike, Berkeley mail, Eudora, Opera Mail, The BAT, PocoMail, Spicebird Mail, EarthLink, Entourage, MailCopa, Chaos Intellect, etc. Through the Exchange emails to MBOX Migration utility, you can convert all the emails from Exchange mailboxes into MBOX format. The software will create a single MBOX file for each folder present in an exchange EDB mailbox. For emails in each folders, the MBOX files can be seen as inbox.mbox, sentitems.mbox and so on. The software works well with corrupt EDB file as it allows you to recover data from it. By default, it will perform a quick scan on the selected EDB file. But, if the file is highly corrupted, then check the option to perform advance scanning. Once the scanning of EDB file finishes, software lists all the mailboxes present in it. You can select any of the folders within mailboxes and preview the emails, contacts, calendars, etc. in its original formation. Also, it will list the properties of each items being previewed like To, from, subject, size of file, contacts name, date, first name, last name, email address and so on. The Software supports Mozilla Thunderbird to view and open the converted EDB files which is in the MBOX form. Note: Migrate the output MBOX files to Thunderbird account using Thunderbird Importer Software, which can be obtained free of cost along with Exchange EDB to MBOX Converter. Apple Mail is the most used MBOX supporting email client by Mac OS users. It is possible to convert EDB files from Exchange to Apple Mail using this Converter Utility. While you select to export data from Exchange Server to Thunderbird MBOX format, it is possible to check or uncheck the respective mailboxes. In this way, you can selectively convert folders having emails in it from each mailbox. The software will create single mbox file for each items that you select. Once the scanning and conversion of EDB mailbox is done, the tool will exhibit the summary of export process. This report will showcase the mailbox name, status of export to MBOX process and number of emails under each user so that it can be used for future reference. Video describing the method to Export Exchange Database Files to Thunderbird, Eudora, Mac Mail, Entourage, etc. Trial version of Exchange EDB to MBOX Converter doesnot provide the option to convert EDB files. But, it lets to Preview the Microsoft Exchange mailbox details during the scanning and loading phase. What makes the EDB to MBOX Converter Software unique from others? Whys should I choose it among other tools? "Please mention the major features of this utility so that I can easily choose it from other products"
Add Exchange Database to MBOX format without any size limitation. Export Exchange EDB files in the absence of MBOX supported email clients. Migrate Exchange Public folders to Thunderbird without data loss. Export Microsoft Exchange Mailbox to MBOX file in a selective manner. I want to move mailbox data from Exchange to Opera Mail. How can I do that? "I work on Exchange environment and Opera mail from office and home respectively. As I need to work from home for a while, I need to migrate Exchange EDB files related to my work to my Opera mail. Is it possible?" Exchange EDB file to MBOX migrator is the perfect tool to migrate Microsoft Exchange to Opera Mail application in a few easy steps without any supportive applications needed. How many Exchange Database files can be converted to MBOX using the Enterprise license? Using Enterprise License of the software You can export exchange mailbox to mbox without any limitation on the number of files. The software can be used on multiple computers across the globe with the Enterprise License. How to access resultant MBOX file in Mozilla Thunderbird application on a Windows 10 machine? Note: You can also try to import MBOX file to Mozilla Thunderbird using an automated solution. Will the software work flawlessly with a 25 GB of Microsoft Exchange mailbox? Yes, it is possible to convert Exchange EDB file of any size with the help of this software. There is no such size limitation within the Microsoft Exchange to Apple Mail Converter. Is it possible to convert exchange public folders to thunderbird? Yes, it is possible to convert both Private as well as Public Folder of Exchange Server with this software. It will show a window where you can select the folders which are to be converted. Can I convert a corrupted Microsoft Exchange mailbox to MBOX with the help of exchange database files to Eudora MBOX Converter? Yes, you can convert data of corrupt Exchange EDB file to MBOX. Software recovers data from corrupted or damaged EDB file and then converts it into MBOX. It has two scanning modes i.e. Normal and Advanced. If all data is not repaired after the Normal Scan, use Advance Scan for severely corrupted EDB files. Is the Live Exchange Server environment necessary to add Exchange account to Entourage 2008? No, Live Exchange Server environment is not necessary for the conversion of Microsoft Exchange mail items. Moreover, the Server should be in offline mode while converting. 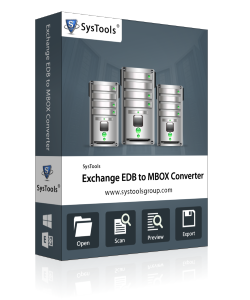 EDB to MBOX Converter comes as a specialized tool which particularly handles the export of Exchange Mailbox to MBOX platform. With the release of this tool, my search for a perfect & reliable tool to migrate Exchange to Apple Mail server became successful. Right now I am able to convert my EDB mailbox to MBOX in the Windows 7 platform. Thanks to the SysTools team. MBOX seemed to be quite right choice while looking for a temporary storage of EDB database files for easy mobility. My friends suggested me to use Microsoft Exchange to Opera Mail migrator for the respective processing and I am grateful to the developers for understanding the market needs and implementing it to work so well. I am very much grateful to the Research and developement team of SysTools. Because I couldnt find a way to migrate my data files from Microsoft Exchange to Apple Mail and after a thorough search on Google, I found the Exchange EDB database to MBOX Converter. I could export my entire Exchange database files without any data loss. As a technical expert, I have come accross a lot softwares in my career. But the simple user interface and fast working of the Exchange mails to Eudora Converter is a surprise package for the common users to migrate Exchange to Eudora MBOX format.I would suggest it to my customers without further thoughts.